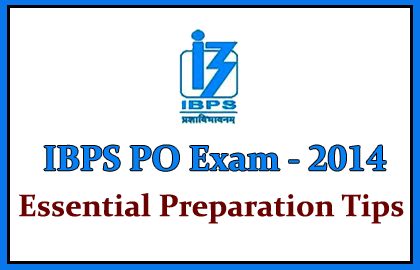 Essential tips for the preparation of the IBPS PO examination 2014 were mentioned below, candidates those who are applied for the exam can make use of it. î Make clear about the Syllabus first. î Point out your Strength and weakness about the syllabus. î Compare the previous exam question papers then you can get an idea about the question pattern. î To attend the General Awareness Questions you need to update yourself daily by reading news papers, current affairs, etc. î While preparing, make you more comfortable, change the topic if you get bored or tired then skip to interested syllabus. For Example: If you are preparing for Aptitude for a long time then definitely you will get bored and lose your concentration at that time move to the another interested topics like computer or G.K.
î To score more marks in English questions, increase your reading ability and understanding skill, for this you required more practice. Daily read at least two pages of English news paper for practice. î Be clear about the previous year cut off and keep your present target marks. î Time management is a main key for success so, manage your time by writing model exams often. î At the last day, don’t try to study anything new, just go through the entire topic that you have already prepared. î Plan well that you need to clear every sections in given time. î If you took longer time in an individual section and of you fine hard then move on to next section. Ex: if you have attended only 20-25 questions in reasoning in 30 minutes then skip to aptitude because maths requires time to do calculation. î According to your strength and weakness, choose and skip the questions. Ex: Some will be stronger in all kind of aptitude questions and some will not but they will strong in English or reasoning. î Try to complete GK and Computer questions in minimum time then it will help you to complete other sections. î If you fell that the question paper in more tough then doesn’t get stressed, it will be tough for everyone. î In the case of aptitude and reasoning fix time for each individual question and complete it in correct time, skip the question if it took more time.